It's finished! 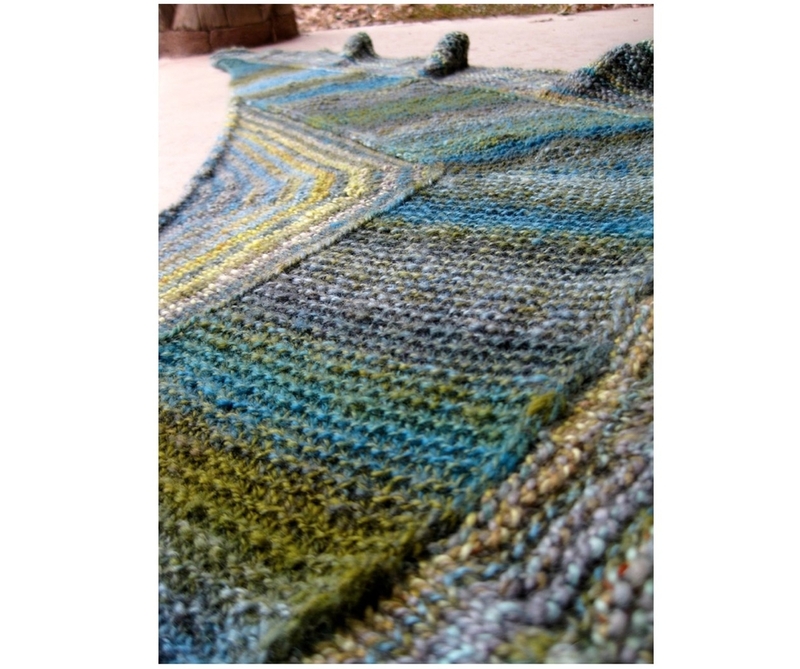 A Handspun High Road, spun and knit during the 2012 Ravellenic Games. I'm really pleased - the stripes and ocean-y colors were just what I was wishing for, and I can see myself wearing this often once the weather cools down. Yarn: Mostly my own spindle-spun handspun: 2-ply BFL from Capistrano Fiber Arts Studio, purchased long ago. I knew when I plied this that I wouldn't have the yardage to complete it, but I bought some handspun (also 2-ply BFL) from Two if by Hand at the DFW Fiber Fest earlier this year. The TIBH colors were brighter, lighter hues of the yarn I'd spun, and though it was a slightly heavier weight I knew it would stripe well. The center panel (worked side to side in garter stitch) is all my handspun. The top section is two-row stripes of each yarn, and the bottom ruffle is also worked in stripes: four rows TIBH yarn, then two rows of my handspun. Modifications: Using the Two if by Hand yarn gave me more yardage than I needed, and I decided to keep going with the bottom ruffled edge so as to make the most out of both yarns. I wanted to add as much length as possible (rather than increasing the ruffle's ruffly-ness), so I slowed the rate of increases by working four rows straight (just following the stitch pattern as presented, and the color pattern written above) in between each repeat in the bottom edging section. Completing this was a challenge for me (I've never even spun this quantity of yarn this quickly before!) but I was determined to follow through and make it happen. Although I got a later start than I wanted to with the knitting portion, I buckled down and knit while watching the Olympics for basically the entire weekend. (I know, such a tough life.) My Ravellenic Games Team DBAJ teammates and I had fun cheering each other on throughout the games; they were so motivating! By the end of Sunday, my hands were throbbing and I was ready for some sunshine and outside time, but I felt downright victorious as I admired my pretty new shawl. Just ahead of time for the coming autumn and cooler weather, my desire to craft is BACK. So happy! I want to finish some WIPs and make some new fingerless gloves and spin more and learn to weave and and and...!! 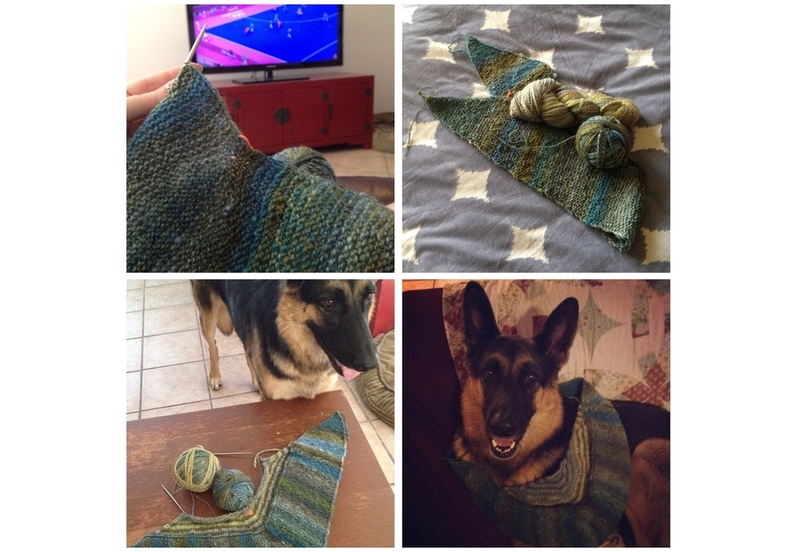 Hanging out in the Ravellenic Games group on Ravelry, and watching all the other crafters meet their challenges and encourage each other, inspired me single every day of this challenge, not only with my project, but for my work, too. Ravelers, you're awesome, and thank you to the mods who worked so hard to organize these Games! Charlie, always eager for a job, helped to hold the shawl down during the very, very windy photoshoot last night, staying calm even as a storm rolled in. Such a good boy. So, yay! I still can't believe that just over 2 weeks ago, most of this shawl was still fiber that had been sitting in my stash for years. Making things is the BEST!